The Grand Opera House is a theatre in Belfast, Northern Ireland. Opened in 1895 its auditorium is though to be the best surviving example in the UK of oriental theatre style. 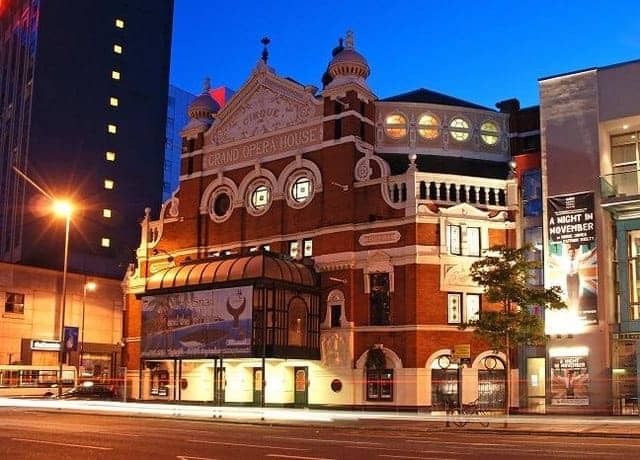 The Theatre has survived periods of disuse, threats of demolition and bomb damage but has continued to thrive, hosting musicals, plays, pantomimes and live music. Extensive renovations were undertaken in 2006 with the addition of a modern extension. Famous visitors have included General Dwight Eisenhower and Field Marshall Montgomery in 1945. In 1963, unknown Italian singer Lucian Pavarotti made his UK debut.